I have never been a big fan of oatmeal. I’m not sure if it’s the texture; it just seems so bland to me. Plus, it takes f-o-r-e-v-e-r to boil the water in the morning (my toddler is very impatient when it comes to food). Yet, I continued to pull it out from time to time. Each time I was left disappointed. So, my poor oatmeal collected dust on the shelf (except for the times I needed it to bake cookies)… until recently. It may have been an article I read that raved about the benefits of oatmeal or the fact that I just grew plain ole’ sick of scrambled eggs, but I decided to give oatmeal another try. Well, I still wasn’t thrilled with it. I ate it. I ate it, but it still felt too bland and blah to me. To my surprise, someone else did like it- W. He liked it so much he eventually abandoned his spoon and began shoveling handfuls into his mouth. In order to encourage my toddler to continue eating this healthy food, I decided I needed to do something to make oatmeal more appealing. Then, it hit me. Why is fruit the only acceptable add-in to oatmeal? Why can’t I try something else, something more savory? 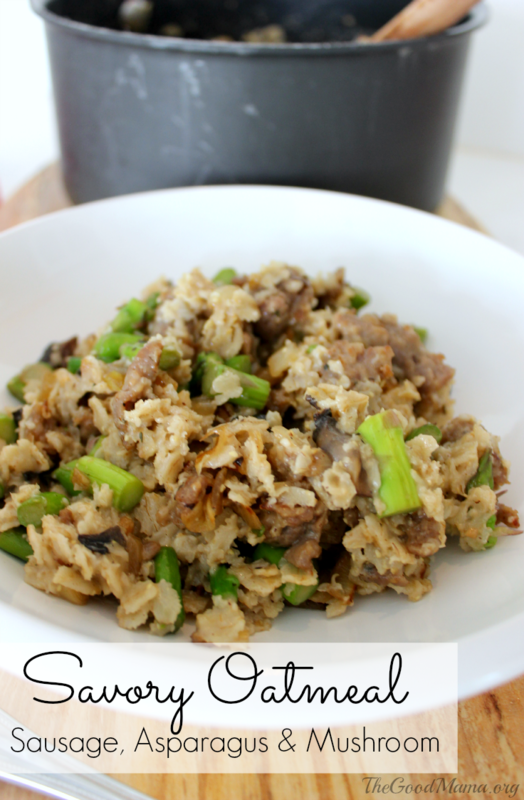 After just a few minutes of research, I discovered tons of savory oatmeal recipes out there. I guess I wasn’t crazy for thinking oatmeal could be a savory dish. After playing around in the kitchen, I came up with a savory oatmeal recipe that your toddler and you will enjoy! Oatmeal is so versatile. You really can play around with it. I threw in whatever I had on hand, but really you could add in whatever vegetables you prefer. If you want to make it a vegetarian dish, just leave out the sausage. 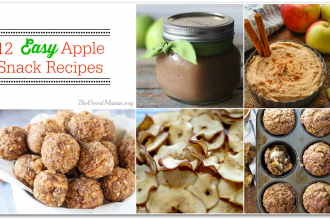 Since W loves oatmeal, I thought this would be the perfect way to sneak in a few more veggies! Take sausage out of casing and sauté over medium heat until no longer pink. Remove sausage. Bring 1 3/4 cup of water to a boil. While waiting for water to boil, add olive oil to pan over medium-low heat. Add onions and sauté for about 3-4 minutes. Add asparagus and sauté for about 5 minutes. When water is boiling, add oatmeal, bring heat down to medium while stirring frequently for 5 minutes. Add the mushrooms to vegetables and continue to sauté for another 5 minutes until the oatmeal is finished. Once oatmeal is finished, stir in cheese. 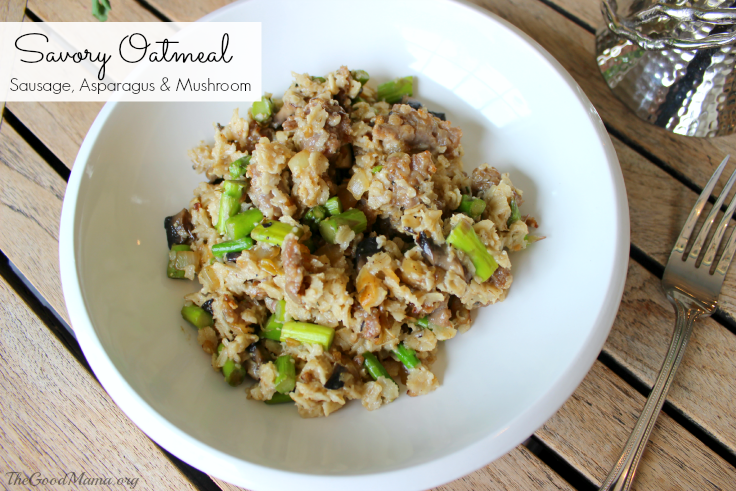 Combine oatmeal with sausage and vegetables. Season with a little salt, pepper and thyme. 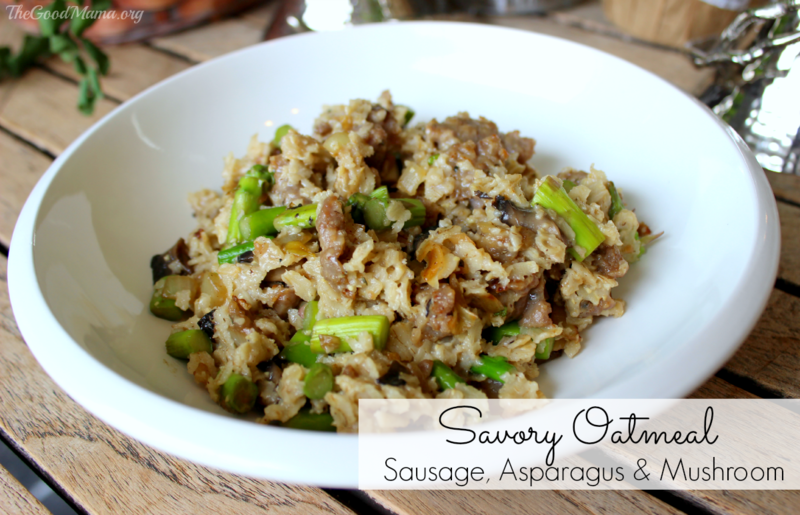 Have you ever tried savory oatmeal? Let me know what you think of this recipe idea in the comment section below! Wow this really looks delicious! I was never an oatmeal fan either but then decided I liked instant permeability chocolate chips and bananas in it haha… Not so healthy!?? So I’ll have to try this! And my youngest especially loves mushrooms! Looks great! This looks delicious!! I actually love oatmeal and my kids do too! My daughter even asks for it sometimes! I’ll have to try this recipe though, it would be nice to do something savory! Tarynn Playle recently posted…A Play or a Playground? I’m not sure I would like this! It’s just a thing I would never put together with oatmeal?! with couscous maybe…ok now I want to try it just to see! lol! so odd but so interesting!!!! that may be one i’ll have to try sometime!!! ooh, yum! Definitely going to try this, and pinning it so I’ll remember! I just saw this post — can’t believe I missed it! I was that miso-oat addicted post-bac who wrote you. Thanks so much for the shoutout and so glad you’re on the savory oat train.